GSE Ink manager is the best-in-class software package that gives you the control and information required to run “lean and smart” ink and printing operations. GSE Ink manager (“GIm”) is supplied as standard with GSE ink dispensing systems. GIm takes care of formula preparation, schedules production runs, recycles return inks and tracks batch numbers. The software also includes extensive search, reporting and connectivity functions. With GIm, getting the best from your dispensing system is easier than ever before. All system users, who subscribe to a service contract, benefit from free software updates as soon as they become available. 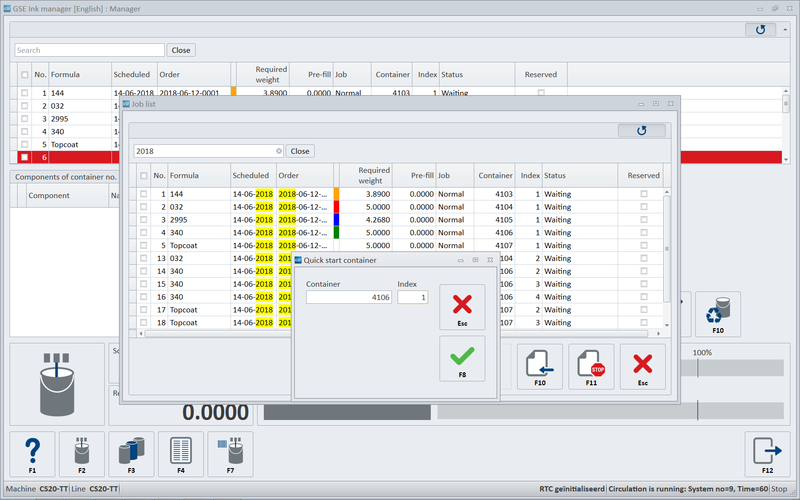 In addition to the basic functionality, GSE Ink manager can be extended with extra functionality. Extensions with additional modules after initial installation are simple to make.